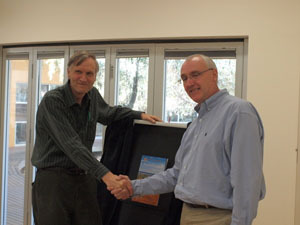 Vice-Chancellors Professor Michael Barber of Flinders University (left) and Professor Barney Glover of Charles Darwin University, at the Centre for Remote Health. The Centre for Remote Health (CRH) is set to unveil its latest research and developments in a showcase event. Established in 1998 as a joint centre of Charles Darwin University and Flinders University, the showcase will illustrate how the CRH has carried out key research and developed education activities that reflect and respond to the unique conditions of remote Australia during the past 10 years. The showcase will highlight current research about remote health systems, the remote nursing workforce, ageing, and the links between the environment and health. Inaugural Director, Professor John Wakerman said that after a decade of quality research and education, the Centre for Remote Health has developed into a recognised and important institution. “The Centre has made significant progress in achieving our mission: making a serious contribution to improving the health outcomes of people living in remote Australia, especially Indigenous people,” he said. The CRH’s education activity prepares and supports health staff working in remote areas, with its research informing both rural and remote health policy and practice. One of CRH's primary aims has been to support communities and health services to benefit not only from the results of research but also from involvement in the research process. CDU staff, researchers, government and non-government health organisations, and members of the public are invited to the showcase on Friday, 21 August from 3-5pm in building Red 1, Level 3, Room 3 Casuarina campus, Charles Darwin University. Light refreshments will be provided. For further information, contact John Wakerman on 0417884182 or Karen Piper on 0439 868 032.